Carol Kitchen, president and CEO of United Farmers of Alberta (UFA) Co-operative Limited. Photo by Ewan Photo Video. Since Alberta’s earliest days, the agricultural sector has been a dominant force in this province. Its impact has been and remains wide spread. From significant economic benefits (farm cash receipts totalled $13.6 billion or 1.5 per cent of Alberta’s GDP in 2015), to cultural and social norms, to important political movements and parties – it has helped shape Alberta into what it is today. As the province has changed over its 111-year history, so has the agricultural sector. There are fewer farms today than there were 30 years ago (the 2011 federal census counted 43,234 farms, 12.5 per cent less than in 2006), while at the same time there are more large farms. Technology, consumer preferences and urbanization are just some of the factors driving change. This change is something Carol Kitchen, president and CEO of United Farmers of Alberta (UFA) Co-operative Limited, is focused on. 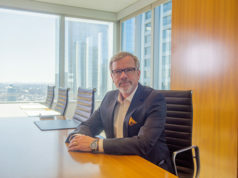 As the head of one of Canada’s largest co-operatives – whose businesses include commercial and retail agriculture, petroleum and outdoor adventure (through its Wholesale Sports retail business) and which brought in $1.33 billion in revenue in 2016 – Kitchen’s task is great. 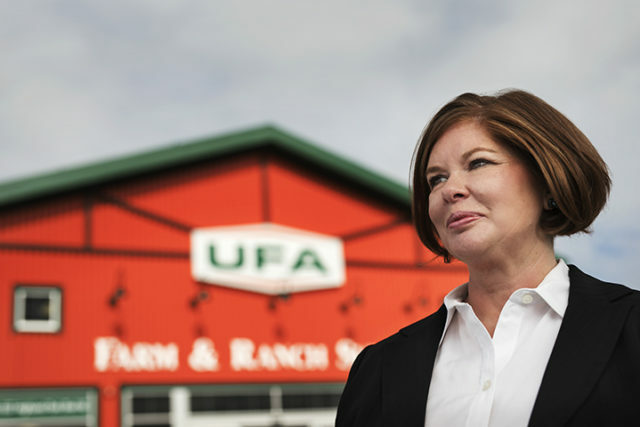 Not only must she meet the needs of UFA’s 50,000 active members and lead the co-operative’s 1,700 employees (300 of which work at the Calgary headquarters), she must also keep her finger on the pulse of the global agricultural sector, which is never static. “There is so much opportunity,” she says from the Airdrie UFA Farm & Ranch Supply Store – one of 34 UFA retail stores in Western Canada. These stores sell crop seed, supplies and equipment, livestock feed and equipment, automotive supplies, building supplies, pet supplies, workwear, fencing, shop equipment, and much more. Kitchen became CEO on April 1, 2015, after moving to Calgary with her husband and 12-year-old son. The last two years have been nothing short of challenging. Shortly after taking over, Alberta’s oil and gas economy took a dive and the provincial election ushered in the new NDP government. Kitchen came from Land O’Lakes Inc., a major U.S. agricultural co-operative headquartered in Minneapolis, where she was a senior vice-president and general manager of a global dairy ingredients business unit with $2 billion in annual revenue. During her 16 years at Land O’Lakes, Kitchen held several positions including senior vice-president of corporate strategy and business development, vice-president responsible for international growth and business controller. Originally from Illinois (she grew up on a farm), she began her career as a certified public accountant. “I’ve worked in almost all the businesses, short of Wholesale Sports, that UFA has throughout my career,” she says. She saw taking over at UFA as an opportunity to demonstrate her leadership skills and build a new team. Kitchen has indeed become well versed in UFA’s history. Founded in 1909 by farmers and ranchers, the UFA political party was elected to form the provincial government in 1921. During its 14 years in power it transferred control of natural resources from the federal government to the province – a move which helped ensure Alberta’s long-term prosperity. As fuel became an increasingly important agricultural input, UFA jumped into the petroleum business in 1953. The move proved genius as fuel would, in time, come to provide the bulk of the co-operative’s earnings. Today, UFA provides fuels, lubricants, diesel exhaust fluids (DEF) and coolants from its 110 fuel locations across Western Canada. It also delivers bulk fuel to both agricultural and commercial accounts. The commercial segment has closely followed oil and gas activity across the province. Kitchen believes UFA must maintain a better balance between its agriculture and petroleum businesses in the future. 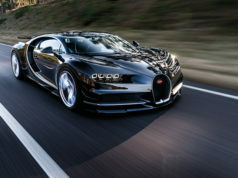 She also plans to keep a better connection between UFA’s commercial businesses – both agriculture and petroleum – going forward. This is, in fact, one of the changes she’s made since taking over. UFA’s commercial agricultural business, Kitchen explains, is about making farmers’ operations more productive. “That can be through crop input (seed and chemicals), livestock supplies, buildings, storage – whatever they need.” It’s also about service; UFA has approximately 50 salespeople who travel to farms for sales and service. Included in Kitchen’s plans for UFA’s commercial business is growth of its cattle and livestock business. “We don’t have as much market share as I think we should,” she laments. “We’re trying to reinvigorate that business.” No wonder, since cattle and calves account for the largest proportion of Alberta’s total agricultural cash receipts ($5.23 billion in 2015). Last year, in a joint venture with CHS (a $30-billion U.S. agricultural co-operative), UFA opened a fertilizer-blending facility in Sexsmith operating under the name Bridgeland. “That market was underserved,” Kitchen explains. “So we built the facility and it’s operating well.” The plant is approved to add anhydrous ammonia (effective for adding nitrogen to the soil but challenging from a regulatory and safety perspective) to its offering. Widely used in the U.S., Kitchen sees it as a competitive advantage. Changes in the regulatory and trade environments, Alberta’s global competitiveness and the diversification of the economy are major concerns. As a member of the agricultural advisory committee for Calgary Economic Development, she’s had several meetings with officials from the provincial government. “They’re working hard, but you’ve got to send the message,” she says. “You have to tell people you’re open for business.” She is also a board member of AgForLife LLC, a Calgary-based non-profit that supports agriculture awareness and farm safety. The reason for UFA’s longevity? “Part of it is we’re very connected to the communities we do business in,” Kitchen says. “We invest some of our members’ money into things that matter to them.” These include 4-H Alberta, AgForLife and the Calgary Stampede (to which UFA gave $103,000, $100,000 and $60,000 respectively last year). It’s also because UFA does its job well. “Agricultural co-operatives were started to create value for their members – helping farmers do something they couldn’t do on their own,” Kitchen says. “Farmers still need that. We aggregate their demand and get them a better price and the service they need.” This, she believes, leads to long-term relationships with members. Whatever Alberta’s future holds, the agricultural sector will have a role to play. While it may be different from the one it played 100 years ago, it will most certainly be important. UFA, its members and the products and services they provide will comprise an essential part of that role.